Save the date for our upcoming event “Motorsocial at the Showboat Hotel Atlantic City” presented by Classic Metal Productions and Dead Rodz Revival. 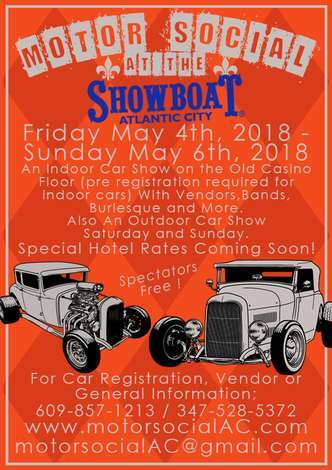 Coming May 4-6th 2018 will be a three day indoor and outdoor event featuring cars, music, some top shelf Burlesque, vendors and parties all right at the Showboat Hotel on the boardwalk in Atlantic City. Starting Friday night and ending Sunday evening, this is an event you will not want to miss ! This page is only for those registering a car or wanting to become a vendor. ALL SPECTATORS ARE FREE ! Spaces are 10’ x 10’ and $ 150 for the weekend, $ 125 if you get a room on site for the event (proof will be needed of hotel stay and refund of $ 25 given prior to, or at time of the event). Need more than 1 space? Not a problem! Get 2 spaces, 10’ x 20’ instead of 10’ x 10’ at $ 250 for the whole weekend, $ 225 if you get a room on site! We think you’ll want to get a room just to take in what the Showboat Atlantic City has to offer, as well as all of the other aspects of the event we’ll have going on! Difference in amount will be refunded day of event with proof of hotel stay. Your gas tank will need to be as empty as possible. Atlantic City Fire Department is asking for 1/8th of a tank or less. You will disconnect your battery and leave it that way for the duration of the show. The gas cap will either need to be a locking gas cap or you will need to tape it closed. Once you have entered the show floor the car needs to stay for the duration of the event. There will be no coming and going allowed for the indoor portion of the show. If you need to leave for any emergency reasons please seek assistance and someone will happy to help. Load in time on Friday night is from 5pm - 9pm and Saturday 7am - 11am. Once the doors are closed for the car load in, they cannot be reopened except for emergency reasons. Please plan ahead and be on time! More details will be added as they are released. On behalf of the entire group participating in the 2018 Motor Social at the Showboat Hotel, I assume all risk of bodily injury, property damage, and personal damage that may occur by participating in the Motor Social at the Showboat Hotel and, for myself/ourselves, their heirs, executors, and administrators, do hereby forever waive and release any and all claims against and agree to hold harmless Classic Metal Productions, Dead Rodz Revival, Showboat Hotel Atlantic City and the Motor Social at the Showboat Hotel. Its committee, sponsors and volunteers, and the City of Atlantic City,NJ with their respective officers, employees, agents, representatives, volunteers, successors or assigns any kind from any and all claims which may be made for any cause whatsoever arising as a result of participation. Further, I hereby consent to allow my picture or likeness to appear in any official document, news release, sponsor advertisement and/or television and radio coverage of the events within or as part of the Motor Social at the Showboat Hotel, and grant permission to use and/or publish photographic portraits, or pictures, videotape or film of me in which I may be included in whole, part, composite or reproductions thereof in black and white and/or color or otherwise made through any media now known, for art, advertising trade or any other similar lawful purposes whatsoever, including the publicity and promotion of this event itself, excluding commercial use of or by marketing sponsors.